Update command in SQL is used to change any record in the table. Records are to be manipulated or updated using update command. Conditional update is the most common type of update command used in MySQL also. You are requested to go through the SQL WHERE command before using update command as both are to be used in proper combinations. Here is one simple command but before trying this please understand the implication of this. Without using any where command (or without using any restriction) the command will change all the records of the table. So let us start with the simple command. This command will change all the records of the table student and will change all the class field to Five. This is not what is required in common cases so we will be changing records based on some conditions. Now we will change all the class four students to class five. Our command should selectively update those records for which class is equal to �four� and will update them to �five�. 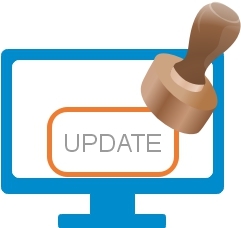 We will use one where clause along with update command for updating the records. This command will update only those records for which class is equal to 'Four'. So this way we can update records selectively. Now let us move one more step and change the records selectively based on some value in some other field. We will change records for which class is equal to 'Four' and mark is more than 70. We will promote those students only who has got more than or equal to 70 mark. This will only change the records for which class=four and mark is more than or equal to 70. We have added two conditions by using AND as a logical operator. This way we can continue with adding more AND combinations to the query. Depending on the logic requirement OR combination can be added to the WHERE clause to UPDATE the records. We will use one more student table where we will store mark obtained by students in three subjects. You can download sql dump of this table at the end of this tutorial. By adding a Where condition we are restricting updating to one record only. Without using Where clause we can update the total table with new data. Let us try to update student marks to 0. The second table columns gets updated by taking data from first table. Let us say we have one table where students test marks are stored along with other details in other columns. We can collect only the test data and keep them in a separate table. Both the tables will have student id field which we will be using to link both tables. Student mark table has two columns, s_id stores the student id and mark column stores total mark of the student. Let us first change the total mark of all students to zero. Now let us update this mark column of student3_total table with sum of subject marks of student3 table. Here is the query. We will create a table with student marks in three subjects. The average mark of each student in three subjects will be stored in a new column. In another column we will store the average mark of each class for all the students. We can update the password field with md5 encryption. To store this data we will change the length of field to 32 char. Here is a command to update password field with new md5 encrypted password. write a update statement no procedure where we can update employee gender column value to female if it is male or to male if it is female. I keep getting syntax errors using that. In my example, I am trying to add the contents of Field1+Feild2 to Field1. I want to update it so that Field1 = 5+2 in this example.